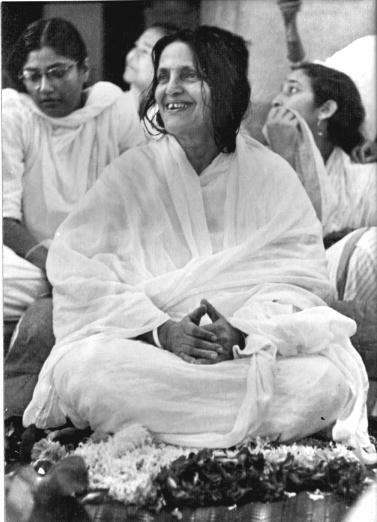 My Guru, Anandamayi Ma taught that there are infinite paths to Self-realization. Anything is possible. However, she also admonished that there are slower and faster paths. Most of us need help. Consider how hard it is to change one little habit, changing your favorite morning beverage, for example. Then consider how exponentially more difficult it would be to change your entire orientation to being alive. 99.99999 percent of us definitely need some on-the-spot help. Now consider this. Why are you doing spiritual practice? Maybe you have some conceptual ideas such as “freedom” or “peace.” But these are not very concrete, especially if you are mostly caught up in karmic fixation. My favorite example concerns chocolate. If an alien drops in from another planet with the assignment to bring back chocolate, it would help to know what chocolate is. No matter how much advanced technology this alien has, the mission will fail if she/he/it cannot recognize chocolate. Armed only with book learning and no teacher, most of us are wandering around with no concrete grasp of what we are looking for. A teacher in a direct realization tradition does not just give us technique. The absolutely fundamental mistake of many students in the West is to treat spiritual practice as mere know-how or “information.” A real Tantrik teacher gives us instruction with a direct transmission of the fruit of the practice. This means that as we embark on a new practice, we have some idea of what we are looking for and we can work with that. The transmission is like a seed and our own effort is the water that allows the seed to grow and bear fruit in our lives. My own teachers have always been adamant about the importance of direct transmission and of working with an accomplished teacher. If you do not work with a teacher, the possibility that your fixations will lead you the long way around is a near certainty. You will certainly be struggling with wrong View and fantasy. Even with a teacher, it is hard not to follow your fixations! Without transmission, you will eventually bump into “chocolate,” but how long will it take? However, there are infinite circumstances. Sometimes, due to sincere, sustained effort and our karma, we receive assistance from wisdom beings, and we can realize the fruit of our practice. Sometimes, a living teacher is accomplished enough to give us transmission and teachings from afar. It is also the case that great teachers have written practice books. It is possible with the right set of circumstances to connect to the transmission of teachers through these books. This is wonderful, but it is still better for you and your realization to have a living teacher with whom you have regular contact. Rarely is a person born who is able to properly find the way to Self-realize with very little assistance from a teacher. Before you decide you are one of them, look deeply into your situation and make sure that you are not in a state of fantasy. Gurus are the natural technology for human Self-realization. When a student is ready, the disciple-Guru relationship becomes available. A student who has not discovered the natural longing for a teacher is not at a very developed stage of spiritual life. This is a fact, not a criticism. I would never tell anyone not to practice if that is your desire. But if you don’t have a teacher and are using books or other means to learn practices, here is some basic advice. The most important thing, if we do not already have a teacher, is to get out of our “I’ll do it myself” mode and ask for help! Use whatever means you have to receive clarification from teachers. Don’t be afraid to write to the author of a book or website or other teaching tool and ask about your specific situation. Any responsible teacher who has put practice information out into the world will find a way to assist you. Only ignorance of Reality makes you follow the habit of “going it alone.” Try to change this habit to one of seeking help. Students are generally timid and/or prideful about asking for help, but if you read stories of other practitioners, you will discover that, through the eons, they have gone to extraordinary lengths to demand and receive teachings. These are the students who eventually Self-realize. Another important thing if you are practicing without the guidance of a teacher is to be vigilant about not fabricating spiritual experiences or accomplishments. Throw out all of your stories. Be ruthless about dumping new age, feel-good fantasies. Be doubly ruthless about examining the truth of your own situation. Take care of your food, sleep and exercise. These are the pillars of sane spiritual practice. Use your utmost discernment and do your best to find authoritative instruction offered by a teacher who has some realization. Once you do find materials from such a teacher, follow the instructions exactly! In other words, don’t mix instructions from Audio A with Book B and Website C. This is an expression of cultural ignorance. It’s another version of “I’ll do it myself.” Try to find a teacher in whom you have confidence, and then follow that teacher’s instructions. You can develop more confidence in Reality this way and have better fruit of your practice. Finally, cultivate your longing for a teacher. Don’t be afraid or embarrassed about this longing. It is the great river that will lead you to realization. Pray and ask from your heart to meet a teacher. Sit with great teachers when you have the opportunity. Don’t give up until life brings you a teacher who is right for you. And when that person becomes known to you, go running.